Do you have a vacation rental website that could use some help? Thinking of getting a vacation rentals website designed for your property? Would you like to increase the amount of visitors to your vacation rentals website for FREE? What if you could get more visitors to actually contact you from your website? Imagine if you could rent your vacation rental like the big boys? All of these are benefits of designing a professional vacation rental website for your vacation home. Smart owners have learned how to receive a large portion of their bookings directly from their rental website, helping them to save money on their advertising by paying less commission. I would like to applaud you for understanding the importance of marketing vacation rentals online, you’re obviously researching ways to improve your rental business. Today everything is on the web and if you don’t have a strong internet presence you’re missing out on lots of cash for your vacation rental, trust me this isn’t hype! As you may know my name is Jay William and I have worked with vacation rental owners for years as the C.E.O. and President of Villa Marketers. I have already made all the marketing mistakes and learned all the latest internet marketing tricks. I’ve studied the market and understand how to get renters to book vacation rentals online. In this book I reveal powerful rental marketing tips and secret weapons! Why waste your valuable time scouring the internet trying to understand vacation rental website software, technology and online marketing? Some of the online marketing concepts are difficult to grasp and apply without the knowledge, this knowledge is power! In my new vacation rental marketing e-book I make things clear and easy. I have created a step by step guide to help you achieve success online. What if you could start off marketing your vacation rental website like a pro? The internet is changing fast and new vacation rental advertising techniques come out on a consistent basis are you in the now of vacation rental marketing? I am and I put all of this valuable information I’ve learned in my brand new book “Vacation Rental Marketing Secrets No One Will Tell You”. This vacation rental marketing e-book has nearly 500 rental tips. 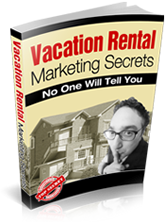 There are over 100 secret vacation rental website tips to help your booking results in the book. The book is more than just a short report it has 150 pages including ways to market vacation rentals for free! You will find this marketing book to be very affordable and every vacation rental owner should have one. It will save wasted time, effort, money and discouragement. It costs only a very small fraction of one extra night you would book as a result of learning these secret marketing tips. Is that worth it to get a wealth of secret marketing tips to guarantee your vacation rental’s success and help you make thousands? THIS BOOK WAS WRITTEN SPECIFICALLY FOR VACATION RENTAL OWNERS & PROFESSIONALS! This entry was posted in Free Vacation Rental Marketing, Uncategorized, Vacation Rental Marketing and tagged free rental marketing, free vacation rental advertising, free vacation rental marketing, free vacation rentals marketing, holiday home marketing, holiday home promotion, holiday rental advertising, holiday rental promotion, rental marketing, vacation rental advertising, vacation rental advertising tips, vacation rental marketing, vacation rental marketing blog, vacation rental marketing book, vacation rental marketing ebook, vacation rental marketing forum, vacation rental marketing forums, vacation rental marketing ideas, vacation rental marketing plan, vacation rental marketing website, vacation rentals marketing. Bookmark the permalink.